TREIRB to fill 400 JL, Librarian, PGT, TGT, PD Posts in TTWREIS through Direct Recruitment 2018: Telangana Residential Recruitment Board to fill the Junior Lecturer, Librarian, Post Graduate Teacher, Trained Graduate Teacher, Physical Director Posts in #TTWREIS Instituitions through Direct Recruitment. #TREIRB to be announced soon for various posts recruitment in TTWR instituitions. 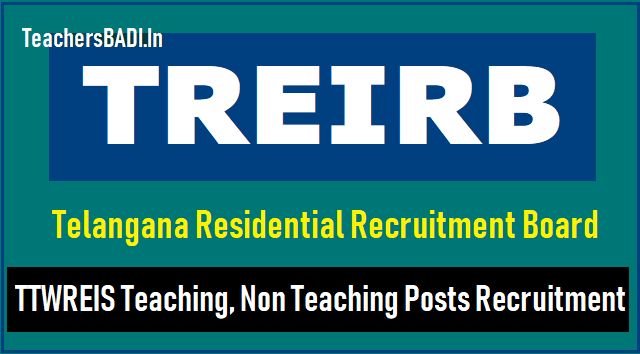 Telangana Residential Recruitment Board JL, Librarian, PGT, TGT, PD Posts Recruitment 2018, TREIRB JL Posts Recruitment, TREIRB Librarian Posts Recruitment, TREIRB PGT Posts Recruitment, TREIRB TGT Posts Recruitment, TREIRB PD Posts Recruitment notifications to be released for fill up the below mentioned posts in TTWREIS Residential Institutions through Direct Recruitment - telangana gurukulam recruitment board Teaching, Non Teaching posts in TTWREIS Instituitions. Public Services - Recruitment - Tribal Welfare Department - Filling up of four hundred (400) vacant posts in various categories in 50 newly sanctioned TTWR Schools under the control of Telangana Tribal Welfare Residential Educational Institutions Society (Gurukulam) (TTWREIS) by Direct Recruitment through the Telangana Residential Educational Institutions Recruitment Board (TREI-RB) - Orders - Issued. తెలంగాణ రాష్ట్రంలోని గిరిజన సంక్షేమ గురుకుల విద్యాలయాల్లో మరో 400 పోస్టుల భర్తీకి ఆర్థికశాఖ అనుమతినిచ్చింది. వీటిలో 50 కొత్త పోస్టులను మంజూరుచేశారు. తాజాగా మరో 400 ఖాళీల భర్తీకి పచ్చజెండా ఊపింది. తెలంగాణ రెసిడెన్షియల్ ఎడ్యుకేషనల్ ఇనిస్టిట్యూషన్ రిక్రూట్‌మెంట్ బోర్డు (టీఆర్‌ఈఐ-ఆర్బీ) ద్వారా ఈ నియామకాలను చేపడుతారు. ఫిజికల్ డైరెక్టర్లు 25 మందిని నియమించడానికి అనుమతులిస్తూ ఆర్థికశాఖ ముఖ్య కార్యదర్శి ఉత్తర్వులను జారీచేశారు. నియామకాలను వెంటనే చేపట్టడానికి వీలుగా గిరిజన సంక్షేమశాఖ తెలంగాణ ట్రైబల్ వెల్ఫేర్ రెసిడెన్షియల్ ఎడ్యుకేషనల్ ఇనిస్టిట్యూషన్స్ సొసైటీ తగిన సమాచారాన్ని సిద్ధంచేయాలని ఆదేశించారు. రాష్ట్రపతి ఉత్తర్వులు, రోస్టర్ పాయింట్లు, ఇతర నిబంధనలను పరిగణనలోకి తీసుకొని వీలైనంత తొందరగా నియామకాలను పూర్తిచేయాలని తెలంగాణ రెసిడెన్షియల్ ఎడ్యుకేషనల్ ఇనిస్టిట్యూషన్ రిక్రూట్‌మెంట్ బోర్డు (టీఆర్‌ఈఐ-ఆర్‌బీ) కి సూచించారు. 1. G.O.Ms.No.22,Scheduled Caste Development (RS) Department, dt:27-04-2018. 2. Tribal Welfare Dept., U.O.No.2651/TW.Bud&Edn/A1/2018, dt.22.06.2018. 2. Government have reviewed the Direct Recruitment vacancy position in Telangana Tribal Welfare Residential Educational Institutions Society (Gurukulam) (TTWREIS). After careful examination of the proposal furnished by the Department and keeping in view the actual requirement of manpower with reference to the nature of work and activities of the department and also the overall financial implications, Government hereby accord permission to fill up (400) four hundred vacant posts in various categories in 50 newly sanctioned TTWR Schools under the control of Telangana Tribal Welfare Residential Educational Institutions Society (Gurukulam) (TTWREIS) by Direct Recruitment through the Telangana Residential Educational Institutions Recruitment Board (TREI-RB) as shown below. 3. The Executive Officer, Telangana Residential Educational Institutions Recruitment Board (TREI-RB) is requested to take necessary steps for filling up of the above vacancies through direct recruitment by obtaining the details, such as local cadres of the vacancies as per the Presidential Order (zone / district etc., as applicable), roster points, qualifications, etc., from the concerned authorities and for issue of schedule for recruitment and notification by the Board accordingly. 4. The Tribal Welfare Department and Telangana Tribal Welfare Residential Educational Institutions Society (Gurukulam) (TTWREIS) shall furnish details of all vacant posts authorized in this order, including the local cadre wise / subject wise vacancy position, roster points and qualifications, etc., to the recruiting agency immediately under intimation to Finance Department. The Department shall issue necessary amendments to their service rules / Bye-laws /Government Orders changing the existing recruitment procedure / recruiting agency, wherever necessary.